This evening shoot of one of the many pleasant streets of Bologna, is from a five-day trip to the city in January 2007 with my girlfriend and in-laws. We went down there to hear my girlfriend’s brother play on Netmage 07. But instead of just being there one day, we decided to take a few more days in the city – one, however, was spent in Florence But more of that in another post. Technically it’s not the best photo on the site, but I really like the film noir feel there is to it. The photo was a little underexposed, which forced me to adjust the exposure up a lot in Photoshop. and the Nikon D70s isn’t the best camera when it comes to noise….., Well I ended up with a great deal of noise in the image, which I normally don’t like. But in this case, it just added to the Film Noir look. I can easy imagine that it is Bogart and Bergman who are walking there. 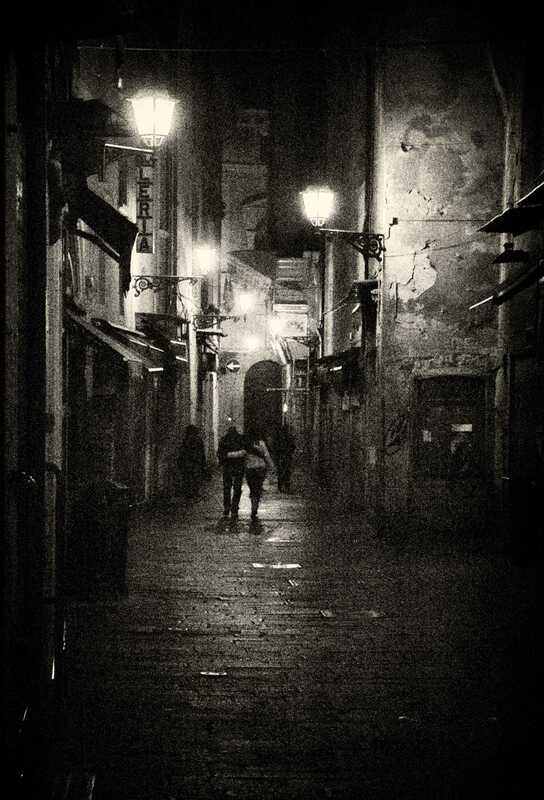 Noir by Bo47 is licensed under a Creative Commons Attribution-NonCommercial-NoDerivatives 4.0 International License.